Let me first test the image by adding this. 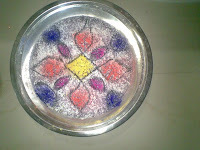 A small rangoli I made for Diwali given the shortage of time since we were leaving for Aurangabad right after the morning oil bath and the rituals. Post Diwali, we had a nice 4-day trip to the city of Aurangabad (of which 2 was spent in driving to and fro). It took us 6 hrs drive from Mumbai to Aurangabad via the Pune route. We reached in the evening and just chilled out at the hotel. I must add that the Lemon Tree hotel where we were put up is fantastic. For the price of 2750 per night, they serve buffet breakfast as well and allow the usage of the swimming pool. The speciality of Lemon Tree Hotel is the fresh lemon fragrance that lingers always. They also have a uniqueness that there are almost 2000 jokes printed and framed onto the walls across the hotel. It was fun reading some weird ones. Day 1 we covered Ajanta and Bibi Ka Maqbara. Ajanta needs no introduction. I was in awe looking at the Ajanta Ellora caves though they were in sorry state. I only wish our government was more serious in preserving the national heritage. One of the world heritage, the paintings and sculptures easily can be called the zenith in arts of all times. Maybe we, with our crumbling houses and dull paintings should look back and learn a thing or two. The 30 caves kept us busy for 2 hrs. Bibi ka maqbara - the poor imitation of Taj was a case study of its own kind. The similarity and differences between the two were striking out. Heres a snap taken by my hubby! 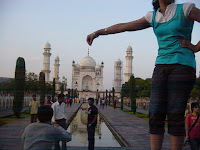 He was so engrossed in focussing on the tip of the maqbara that he missed the top of my poor girl !!!! Here she stands headless. Day 2 found us in Ellora. Again the caves are too good to be missed. Divided into the Hindu, Buddhist and Jain caves, these mainly comprise of a more developed form of sculpture as compared to Ajanta. Kailash temple in cave no 16 is the highlight. We missed going to Daulatabad fort. Oct heat was the deterrent. But people planning to visit Aurangabad must go there. We also visited Panchakki - the water mill ( I did not find it impressive). We tried rushing to Paithan to see the silk weavers at work but alas, the factories close by 3 it seems. So, we had to return all the way back. Even though the mornings and noons were packed, evenings gave us some relaxing times and left us with nothing much to do. Luckily, there was Fame multiplex right next to the hotel and yes, you guessed right. We saw 1 film each on both the free evenings ;) - Blue and All the best. Blue was a huge disappointment while All the best was too good and a riot! My tummy ached with too much laughter. Tried to make a hill temple! 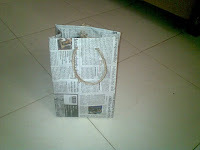 Paper bags I made to give the haldi kumkum in. Hope you all had a great navratri and heres wishing you happy Deepavali in advance. I love this festive season. Let me on the onset admit that this is not a review of any movie but the fact is that I saw Kaminey last week and loved it to the core. It’s THE movie of recent times for sure. It had just the right combination of everything and made a perfect treat for hungry eyes, ears and minds. All these made to simmer over brilliant direction made for something not to be missed. But then this dish is like the continental and exotic serve. Either you have the taste for it and will love it. Or you will not! Simple. There have been a couple of my friends who have felt let down and have been found exclaiming “paisa bhi hum kharch karein aur bheja bhi? “ (Meaning why should we spend money as well as brains? ;) You get the drift! I will not go into the storyline or a review here since I feel too inadequate for that. I am not one of those who can observe and comment on the nuances. You can read many of the brilliant posts already published. The point of the post here is one among the many points which was raised in the movie- that of division on the basis of region. I have already written once against the anti-north-indian attitude of certain politicians in Maharashtra. This movie beautifully brings forth the issue without dwelling too much upon it and yet making sure that it makes its presence felt. But isn’t it true in our everyday affairs to categorize a person solely based on his surname and/or region, especially so in India. This categorization is not on the basis of external characteristics but more on traits. I remember my growing up years in Delhi. My father had a shrewd, calculating, bully of a colleague who also happened to be a Sindhi. Needless to say, one of the favorite dialogues mouthed by my father was “trust a snake, but never trust a Sindhi” while I listened attentively and processed the information for future usage! My father being a Palakkad Iyer, obviously has good words for his brethren. Oh, they are the neatest lot and the most hardworking at that. After shifting to Mumbai, I started attending my PG classes. During one of the classes the Maharashtrian teached started rattling off in Marathi in answer to a query from a student. He did not even bother to notice that a few of us could hardly make head or tail of the conversation! Irked by this, one of my Tamil friends remarked “These marathi people are just so ill mannered. They start chattering in their language irrespective of other people around”. It was quite ironic that years later, another of my juniors, who happened to be a Marathi, and working in Chennai, called me up and started complaining over the same issue- that in meetings, everyone sta rts speaking in Tamil while she has to look around clueless! How can I forget to mention Gujjus. When I got to stay in Gujarat, there were ofcourse the typical statements like “oh these lazy gujjus. They sleep all through the afternoon!” Or, “These people live to eat”. Ever wondered why is it that certain traits are attributed to regions? Why is it that Maths teachers are generally Tamilians? Why are nurses and stenos from Kerala? Why are the most famous singers of Bollywood from Bengal? Why are most of the successful businessmen from Gujarat? Why are many of the soldiers from Gurkhaland? Maybe regions do have an effect on the nature. Could it be that climatic conditions play a role in conditioning all this? Or is it the food habits that have been passed from generation to generation? 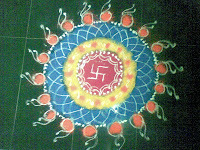 Is it the traditions, the customs behind the display of such typical characteristics? Here is the summary of various tidbits I collected based partly on hearsay and partly by observation. Polite Hindi speaking, more inclined towards public services and politics, hardworking. Systematic, Neat, Short-tempered, would readily help other mallus, a clos community. Culture loving, fanatics (for good and for bad), extremely loyal to their state. Religious, artistically inclined, good sloggers, timid (save a few politicians), too rigid, less tolerant. There are exceptions to the rules but I feel that nature of a person is the resultant of the environment he is growing up in and that very well constitutes the region. But having said all the above, the fact remains that India of today is changing for sure. There are people like me who are basically metro-born-and bred, who have mixture of habits borrowed from all around. So, this hybrid breed is surely breaking all the rules that have no basis. And till such time, this hybrid breed takes over India, we will keep having fight between states and our neighbours would keep using such differences as a weapon against us! p.s. the mudra on the header is mine... some 20 years back. Gosh, even I cant believe it! This and That : When swine flew! The alarm clock started singing mauja hi mauja. I hit it hard on its head and went back to sleep. And down went my walking plans for the nth time! So there! This is what happens if I let a little break creep into my nicely laid out routine life…and then the break becomes my routine. You get the drift. Yeah I am a routine freak. Newton would have loved to have me as a sample – a creature who loves to be in the state of whatever-state-she-is-in! But one fine day it dawned upon me that I have this tiny whiny cyberspace. So, now I just need to break this state of laziness; of setting-alarm-and-shutting-it-up-and-sleeping-back, carting-myself-to-work-to-get-bored, back-home-and-ofcos-sleep-again with nothing in between. And what could be better than scribbling on my blog. Well, where do I begin? OK, I want to confess that I am one of those who got into panic due to recent flu in the town. But, it was certainly not on the day I read about the poor young little girl Reida, who was the first (recorded) victim of this swinest swine flu. Pune still seemed quite far off from Mumbai. But, the day I got to know that a class 12th student in the very school my kids go to, has contacted this virus and has been rushed to Kasturba hospital, thats the day I got my first panic attack. Somehow, it felt too close now. I admit, that I was one of those who paid an exorbitant 25 rs for masks which actually are worth only 5-10. But ofcourse, now I am recovering from the panic attack. I am seeing to it that hands are washed often with soap and water, lots of fluid intake is happening and overall hygiene s maintained in the household. Besides that certain herbs like turmeric and tulsi are being used more! I guess, awareness is the key. And here goes my prayer to the Almighty to cause no more deaths due to this viral attack. That brings me to another point. I wanted to see Kaminey so very badly! But it will release in Mumbai only on monday. Sigh! Let me see if I can catch hold of tickets for monday then. BTW, to all those who kept banging the doors of this sleeping blog to check if I am fine, you people are a sweetheart and hopefully I will be more regular now. To all those who tagged me, you people are also sweethearts for still having hopes on me :-), I will do them soon! Heres wishing all a very happy independance day. Lets hope we learn to become more responsible citizens and India shines in the real sense of the word. Just like forwarded mails, I feel that tags are ways of reminding people that we are thinking of them. Thanks Abha and Monika, for not losing out on me and this tag they passed on to me is pretty simple since its Q&A only! So here I go. Nopes. But I made it a point not to live upto it! When I was peeling onions today morning! I dont like small insects crawling… there I answered it! Yeah but I am wondering why this question should be a part of this questionnaire. I need to find the person who started this! “Main apni sabse favourite hoon” courtesy Kareena in Jab We met ;) For the uninitiated that statement means “I am my most favourite person”. So obviously I would love to MY friend! As long as people can laugh it off ! I never had one. Am I considered normal now? Dint you know LAZINESS is my middle name? 12. IF YOU WERE TO PICK YOU OWN FIRST NAME, WHAT WOULD IT BE? This question comes a little late in my life nevertheless I had a fascination for Hema once. Talk about influence of cine world on common man! I am short of temper! How do I buy it? Somehow I adapt pretty fast and so at this moment am not missing anyone! My neighbours blabbering about some website development. Mehndi, coffee, wet earth, Johnsons baby powder! A friend- casual daily stuffs! nothing cos I don’t have one. Someone please buy me one! A fan whirring in a quiet room. That’s soporific!!!! I can touch my nose with my tongue! OK That was a lie but my hubby can do that. 46. WHERE WERE U BORN? Lots actually. Among the new bolly songs I am loving Mar jaawaan from Fashion! Tags are good way to know new friends. So, passing it to some friends here I would love to know more about. Verbivore, Kanagu, Girl-next-door, Workhard, and all of you who wish to take it up. Its been sometime now since my younger daughter has taken to writing with pen in school. And yesterday while I was buying refills for her gel-pens for the 138th time this year, I suddenly got nostalgic!!! I still remember my first day in Class 6 which was filled with apprehension, fear, anxiety that catches hold of you when you are suddenly going to be officially declared as senior! 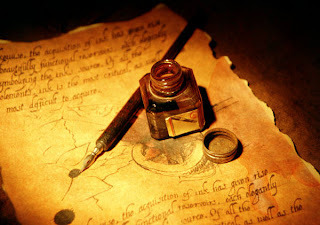 But then, it was this excitement of starting to write with pen which masked all the other feelings. Somehow, the 3 letter P, E and N was the passport to adulthood, to maturity, to seniority. It marked the end of kiddish era of PENCILs. PENs meant that finally we have arrived (though WHERE noone would know). We were not allowed to write with ball-point pens and so fountain pen it was. I can proudly say that my first ever PEN gifted to me by my father stood by me for 7 years till the end of my school education. It used to be quite a ritual no less than the famed tea ceremony, this art of filling ink in the fountain pen. There were many ways of doing the needful. You had cylindrical storage type pen where you just needed to fill the ink and the ink would trickle to the nib enabling you to write. Then there was this pump type where you had to dip the nib of the pen just enough into the Camlin’s ink-pot (I wonder if the kids of today know the meaning of this word) holding a valve tight and on release of the valve, the ink would be sucked into the pen. I would dutifully keep a duster by my side during this ritual of ink-filling since it would invariably lead to ink-baths everywhere. A piece of chalk would also be kept handy, since chalk absorbs ink fast. After filling the pen, the tips of my fingers would attain a dark blue hue and somehow it gave me a feeling of what a hard-working student I was! The ink-pens were also source of mucho joy in school though looking back I find the acts pretty wrong. But when you are young, there is nothing called wrong when it comes to times you are having a good laugh. All the bothersome and unpopular teachers would find ink stains on their sarees or shirts or trousers. And ink being ink, would not be scrubbed off easily! I had many lasting ink stains on my uniform too, not that it ever bothered me. As an aside, I have been told that blue ink has anti-inflammatory property and soothes a burn. Never tried it but have heard my grandparents vouch for it. 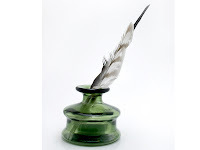 Coming back to pen, the nibs of the pen were the most delicate parts. One hard push and phooosh! They were gone. Oh and let me at this stage, confess that inspired by Ved Vyas of Mahabharatha and all those classic mythological serials and movies, I did try to quill-write using the feathers of pigeon ( I could not find one of the peacock) but dipping in the inkpot for every second word was something which was testing my already low patience and hence the idea was discarded. Exam times saw me packing 5-6 extra pens and ofcourse the ink pot. So, now when I need to rush to that book store for buying assortment of refills for the gel-pens of my kids, I try to think of the plus. Atleast they don’t get their hands stained like we did and atleast their teachers sarees and dresses are safe!!! 1. I get to see the sunrise and save 20,000 rs. How? Well, I have seen people spend that much on a trip to Goa and then come back with pictures of sunrise. Ah, dont mind me. I am just being plain jealous you see! 2. I get a chance to be philosophical and come up with phrases like “The light sweeping the dark night away” / “The nature tosses its orange ball yet again”! 3. If I end up with a group walk, then I catch up on the latest buzz of the town before the broadcast by my maid servant! 4. I have a reason to buy new clothes and new shoes. 5. My bonding with sleep increases; I mean I start valuing and loving and appreciating the art of sleeping more and more. So, I make up for the lost sleep on sunday afternoons and its bliss! 6. I can escape the task of making dinner with the excuse that I got up early, you see. Please have this rice with sambhar, I am sooooooo tired! Same reason if I am caught napping in office. 7. I can catch the worm I can pick flowers for the daily pooja. 8. People listen to music while they walk but I practice my vocal skills without fear of people shushing me! So, its me, my tanhai, my Ragams and with the accompaniments of birds, and ofcourse occasional dog barks!!! 9. One of my favouritest pastime is to observe the lights in the various flats of my colony; and wonder what the person would be cooking, whether that kid would be up and getting ready for school, whether that couple is getting late and rushing to catch 7:09 local! Oh, I have an alternate profession in hand, just in case! 10. I can give a competition to Kareena… OK OK if not Kareena, her mom?? OK OK Her grandmom? See how goalpost keeps shifting!